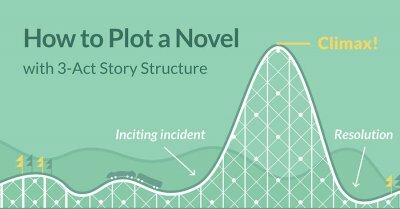 Nothing makes the challenging task of writing a novel feel more attainable than adopting a story structure to help you plot out your narrative. 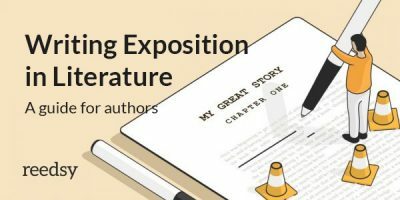 While using a pre-existing blueprint might make authors worry they’ll end up with a formulaic, predictable story, you’ll find that most of your favorite books can be grouped into various narrative structures that writers have been using for decades. 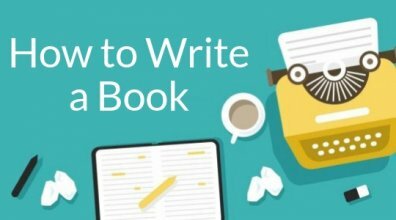 In this post, we’ll cover three story structures you can use to bring your own novel idea to fruition. Narrative structure is composed of two things: story and plot. Whereas the plot is a chain of events that dictate a book, the story refers to the underlying factors that drive the dramatic action. Story, then, would encapsulate the protagonists, key conflicts, and setting of the book. Meanwhile, plot would indicate the connected plot points that make up the narrative at hand. The importance of narrative structure is in its name. If a story didn't have structure, then it would be a formless blot without a clear beginning, middle, and end. 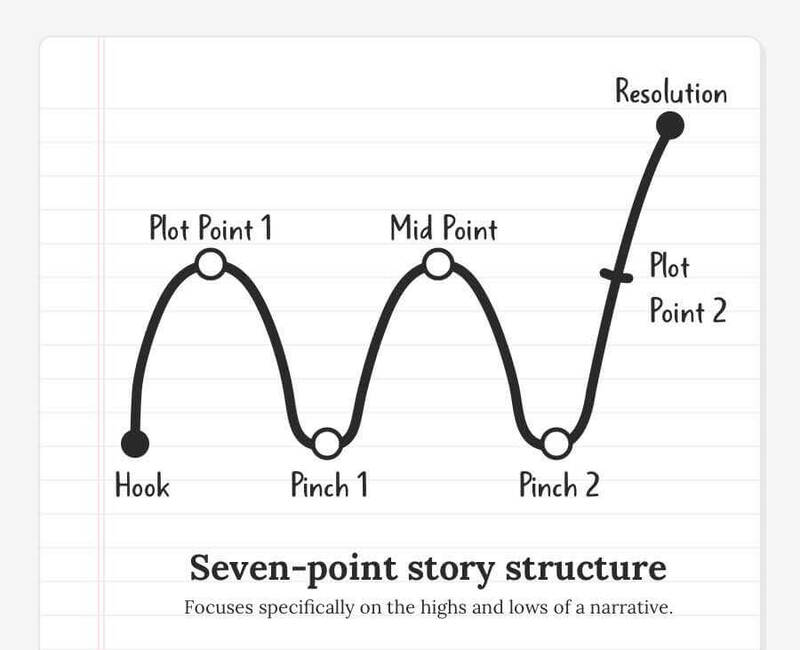 It's story structure that lends definition and comprehensibility to a narrative — which is paramount to holding a reader's attention throughout a story. 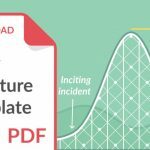 From now on, we’ll discuss three more approaches you can use to structure your story: the Fichtean Curve, In Media Res, and the Seven-Point Story Structure. Elaborated on in John Gardner’s The Art of Fiction, this narrative structure sees the main characters go through a series of obstacles on their way to achieving their overarching goals. While it resembles Freytag’s Pyramid, it encourages authors to write narratives packed with tension and crises that keep readers eager to reach the climax. 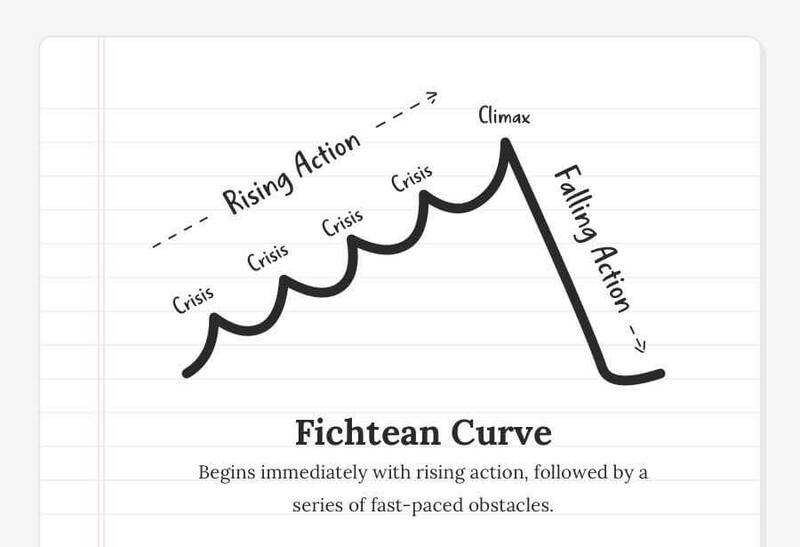 The Fichtean Curve starts with the inciting incident, and propels the story straight into the rising action. Multiple crises should occur, and each of these should contribute to the readers’ overall understanding of the narrative — replacing the need for the initial exposition. Let’s take a closer look at how this narrative structure works, using Everything I Never Told You by Celeste Ng as an example. Example: The novel begins with the line: “Lydia is dead. But they don’t know this yet.” Within the first three paragraphs, Marilyn realizes that her daughter Lydia is missing. Thus, readers are thrown straight into rising action as Marilyn anxiously checks all the places Lydia could be. Lydia’s family is informed her body was found in a nearby lake. From the climax of the the first crisis, the narrative jumps back and forth between flashbacks and the current mystery of Lydia’s death. This provides exposition and details about the family’s history. This occurs in one of the flashbacks. We discover that eleven years ago, Marilyn leaves her family without notice to pursue an undergrad degree. In her absence, the family begins to fall apart. Marilyn faints, learns she is pregnant, and is forced to return home. She gives up on pursuing further education forever, and instead places the pressure of academic success on Lydia. Jumping back to the day Lydia died, we see her feeling misunderstood by her parents, and mourning the fact that her brother is going away for college — leaving her to fend all of the pressure from their parents on her own. Feeling totally isolated, she tries to seduce a friend from school — who rejects her advances and explains he’s in love with her brother. All of the crises of the rising action should build tensions towards, and correspond with, the story’s major climax. Like the three-act narrative structure, the Fichtean Curve’s climax typically occurs two-thirds through the book. Example: Reader’s know this moment is coming but aren’t sure how it will unfold. Lydia takes a boat into the lake in the middle of the night, deciding that if she can overcome her fear of water and swim a few yards to the shore, she’ll be able to reclaim control of her life. The chapter and climactic moment end with Lydia jumping out of the boat and into the water. Readers already know how this turns out. From the climax on, some level of resolution is achieved and readers get to at least glimpse what the “new norm” is for the characters. Example: The final scenes of the novel show the family finally learning to count on one another during the grieving process — and learning that while they may never be able to make their amends with Lydia, they can learn from her death. Not all of the loose ends are tied, but readers are given the impression that the family is on the road to recovery. 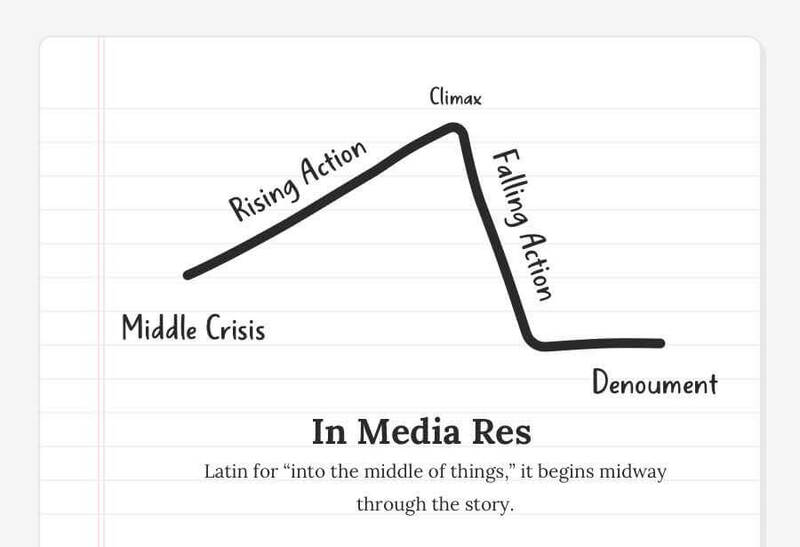 While the Fichtean Curve also begins without exposition, you can think of In Media Res as beginning on the third or fourth crisis of a Fichtean Curve. This way, the stakes are already high, and the rest of the rising action is devoted to filling the blanks and explaining why this conflict exists to readers — all while continuing to build tension. Because of the rising flood of crises, the Fichtean curve tends to work well for action-packed novels, such as thrillers or mysteries. Let’s take a closer look at this narrative structure using The Odyssey as an example. Whereas in the three- and five-act narrative structure, the story starts with the everyday life, before the protagonist sets out on some kind of journey, with In Media Res, the story starts in the thick of it. Example: If plotted using the three- or five-act narrative structure, The Odyssey would likely begin at the end of the Trojan War, when Odysseus first sets out on his journey home to Ithaca. However, Homer starts the narrative halfway through Odysseus’s wanderings, in the the thick of the story. We find Odysseus at rock bottom, and then want to know how he got to this point where things are going so poorly. While the beginning of the story introduces us to the conflict at hand, the Rising Action involves the slow zoom-out of the camera so that we can begin to get an idea of the bigger picture — and what led the story up to this point. This is often done through dialogue and flashbacks. Crises also occur here, building up towards the climax. Example: Through the rising action, we also get exposition; as the story that’s already in motion continues to unfold, details about what happened before the midpoint begin to come into focus. In The Odyssey, the rising action occurs as Odysseus’s travels towards Ithaca, and we learn more about the mob of suitors who have overrun Odysseus’s palace, tried to court his wife, and murder his son. Finally Odysseus arrives back home disguised as beggar where he plans to punish the suitors. As with typical climaxes: the tension breaks and the turning point takes place. Example: With the help of his son, two servants, and the goddess Athena, Odysseus — still disguised as a beggar — strings the great bow and kills all of the suitors. He then reveals his true identity. Exposition often takes place during the Falling Action, further adding to the context of the story. We learn more about how the conflict came to be, and the character is given a chance to reflect on the climax. Example: Odysseus and his wife Penelope can finally be together again — but she has a test planned to ensure it’s the real Odysseus and not an imposter. He passes the test to her satisfaction and they reunite. As with typical denouements: loose ends are tied and lingering questions are resolved. Example: Odysseus and his son go to the countryside to visit Odysseus’ father. The three of them are confronted by a battle with the grieving families of the dead suitors. Athena intervenes and get everyone to agree to peace. In Media Res is Latin for "into the middle of things." Sometimes, it's exactly where a story should start. 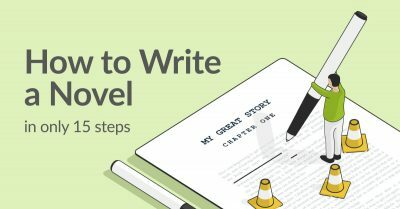 According to the Seven-Point Story Structure-creator, author Dan Wells, writers are encouraged to start at the end, with the resolution. 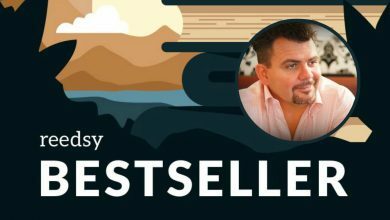 You should have an idea of what the final state for your protagonist/plot will look like. Once you’ve got that determined, go back to the starting point — the hook — and have your protagonist/plot begin in a state that contrasts the final one. From there, fill in the rest of the five plot points to flesh out how the protagonist/plot gets from that first state to the final one. Let’s elaborate on this narrative structure using Harry Potter and the Philosopher’s Stone as example. The start of the seven-point narrative structure is meant to draw readers in by explaining the protagonist’s current situation. Their state of being at the beginning of the novel should be in direct contrast to what it will be at the end of the novel. Example: The novel starts out with Harry living a neglected life in the cupboard under the stairs of his Aunt Petunia and Uncle Vernon’s home. Whether it’s a person, an idea, an inciting incident, or something else — there should be a "Call to Adventure" that sets the narrative and character development in motion. Example: Hagrid arrives to tell Harry that he’s a wizard. With Hagrid, Harry escapes the Dursley’s and head off to Diagon Alley to prepare for his new life as a wizard-in-training. 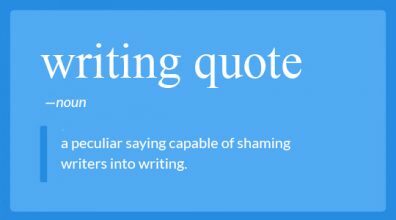 Things can’t be all sunshine and roses for your protagonist. Something should go wrong here that applies pressure on the main character, forcing them to step up and solve the problem. Example: A troll is found in Hogwarts on Halloween. Harry and Ron go to find Hermione who is unaware of the troll. They end up luring it into and locking the troll in the girl’s bathroom — without realizing that’s exactly where Hermione is. Together, they take down the troll. A more apt name for this part might be “Turning Point” — as it doesn’t technically need to fall in the middle. But it does need to include the main character changing from a passive force to an active force in the novel. Whatever the narrative’s main conflict is, the protagonist decides to start meeting it head-on here. Example: Harry, Ron, and Hermione learn about the Philosopher’s Stone, and realize it’s being kept guard in Hogwarts. They also learn that Voldemort is after the stone and decide they must find it before he does. Not again! The second pinch point involves another hit to the protagonist — things go even more awry than they did during the first pinch point. Also called the “Dark Night of the Soul,” this might involve the passing of a mentor, the failure of a plan, the reveal of a traitor, etc. Example: The trio journey through the magical protections set in place to protect the stone. Harry loses Ron and Hermione on the way, leaving him to confront Voldemort on his own. Phew! After the calamity the protagonist undergoes in the Pinch Point 2, they learn that they’ve actually had the key to solving the conflict the whole time. Example: At the height of the story’s primary conflict, Harry looks in the Mirror of Erised. Because his intentions for finding the stone are pure, the stone appears in his pocket and he learns that if Voldemort touches Harry, it will harm the dark wizard and not himself. The story’s primary conflict is resolved — and the character goes through the final bit of development necessary to transform them from who they were at the start of the novel. Example: Armed with the discoveries the Mirror of Erised gave to Harry, he defeats Voldemort. 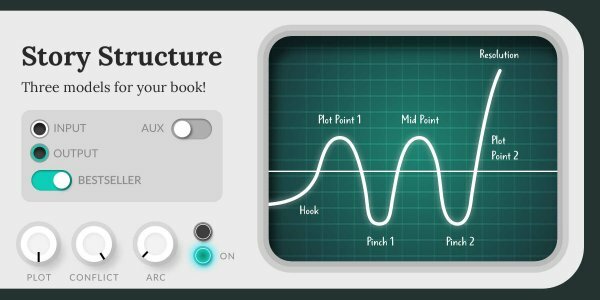 We've said it before and we'll say it again: story structures aren't an exact science and you should feel welcome to stray from the path they present. They're simply there to help you find your narrative's footing — a blueprint for the world you're about to start building. May I point out a slight mismatch between the contents/descriptions of plot points in this article and those you defined in "What is a Plot Point" article. It may be misleading/confusing for beginners. Thought it would help the reader if you resolved this issue. Your blog is the greatest and I, being a beginner, have learnt a lot from it. Thanks a bunch. Am truly grateful. Cheers! 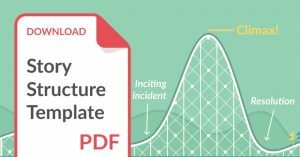 Master the three-act story structure with the help of our free downloadable template.